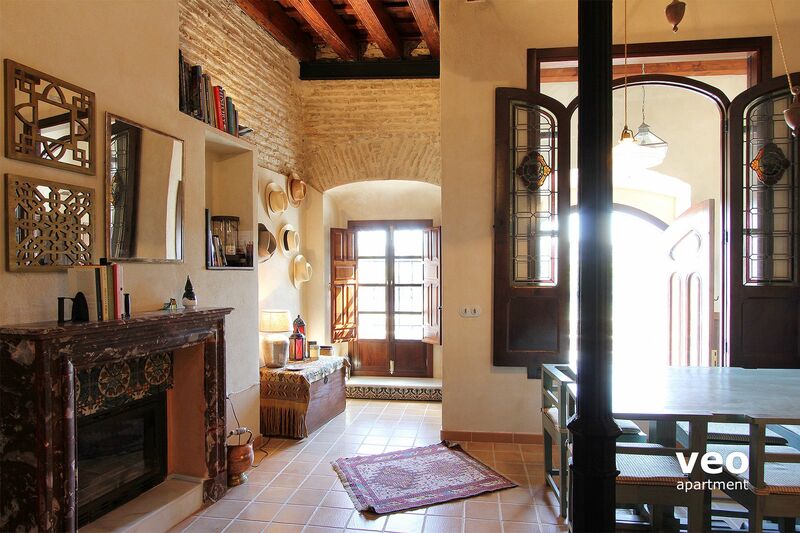 Wonderful town-house with a split level terrace and outstanding views over the Guadalquivir River. 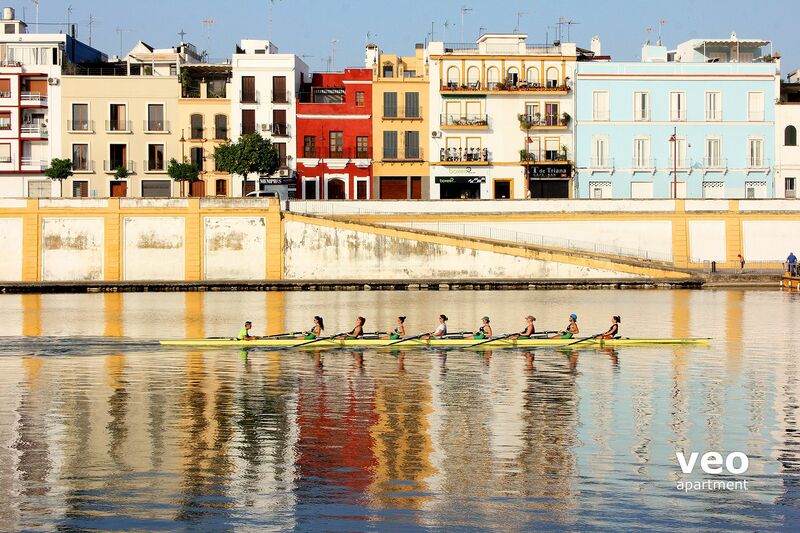 It is located on picturesque calle Betis in the Triana neighbourhood. 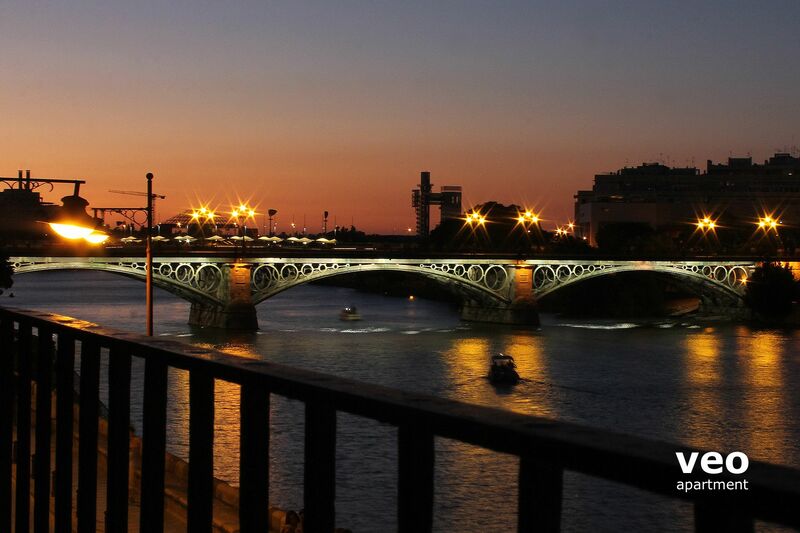 Views from the house include some of Seville's most famous landmarks: Triana Bridge, La Maestranza bullring, the Torre del Oro and the Cathedral tower - La Giralda. The house of 190 square metres is distributed over three levels. There are 3 bedrooms and 3 bathrooms to accommodate up to 8 guests. 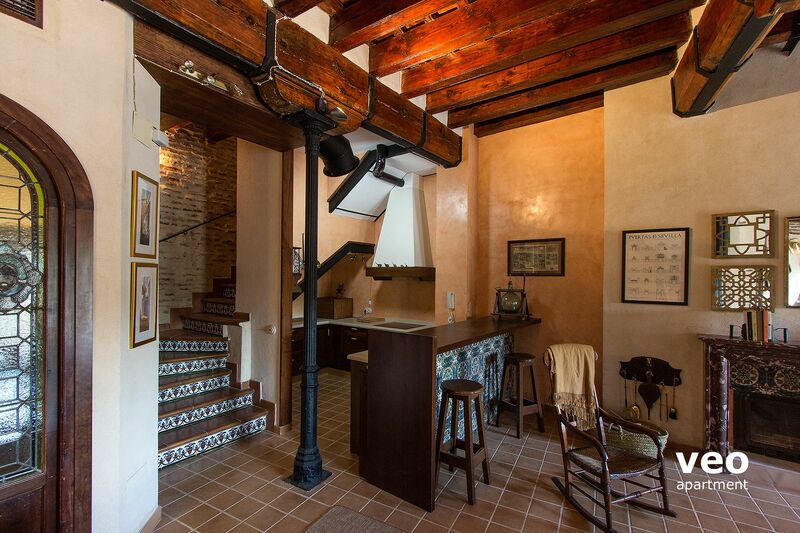 Refurbished to a superior standard while remaining respectful of the original architecture, the interiors combine modern elements with traditional features of Sevillian craftsmanship: carved wooden doors, wrought ironwork, exposed brick walls, wood beamed ceilings and ceramic tile work. Ground floor: spacious open-plan living room with plenty of seating and a dining space. Through a large window you can enjoy river views while having your meal. The kitchen is well equipped with utensils and appliances. These include oven, dishwasher, washing machine and tumble dryer. There is also a separate toilet on the ground floor. First floor: bedroom 1 is furnished with a double bed, wardrobe and has an en-suite bathroom with shower. Bedroom 2 has two beds (one bed is on a raised wooden platform). 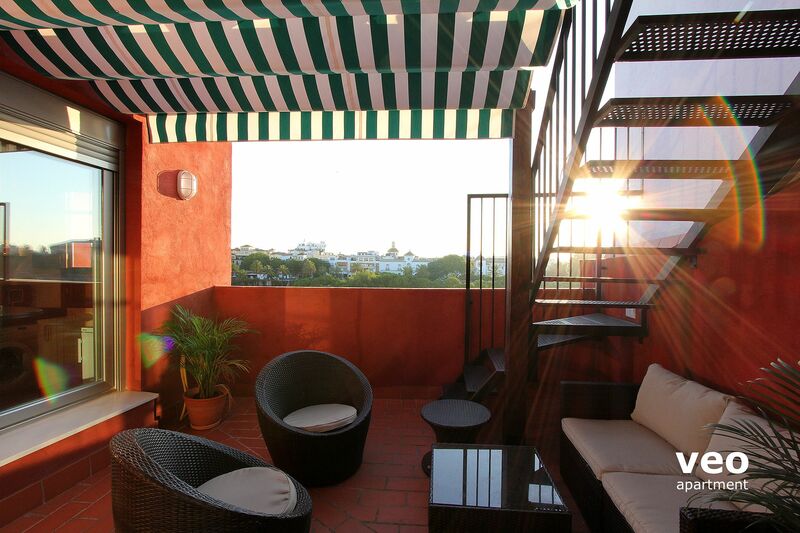 Both rooms have balconies looking out onto the Guadalquivir River. 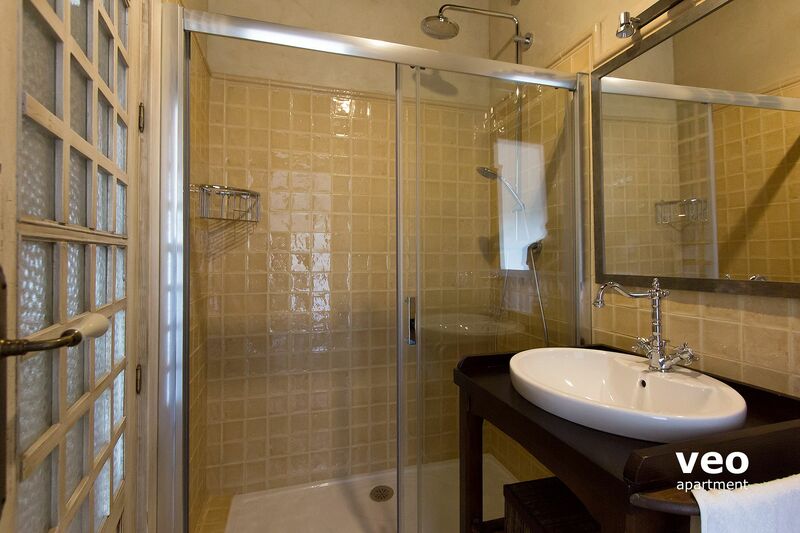 There is also a separate bathroom with a shower on the same floor. 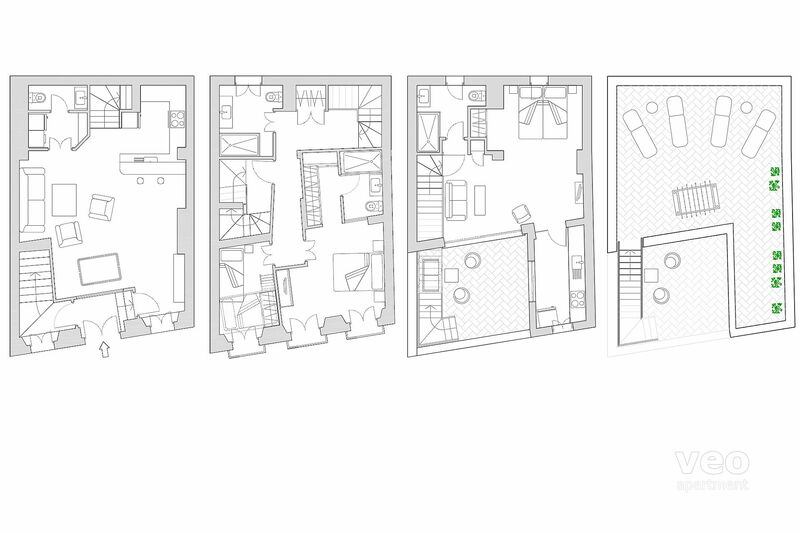 Second floor: independent open-plan suite - which includes a living area and in a recess, twin beds and a wardrobe. There is a separate bathroom with a shower. The suite has its own separate entrance from the ground floor. To one side of the terrace, there is a fully equipped galley kitchen - useful for preparing a meal for eating outside. 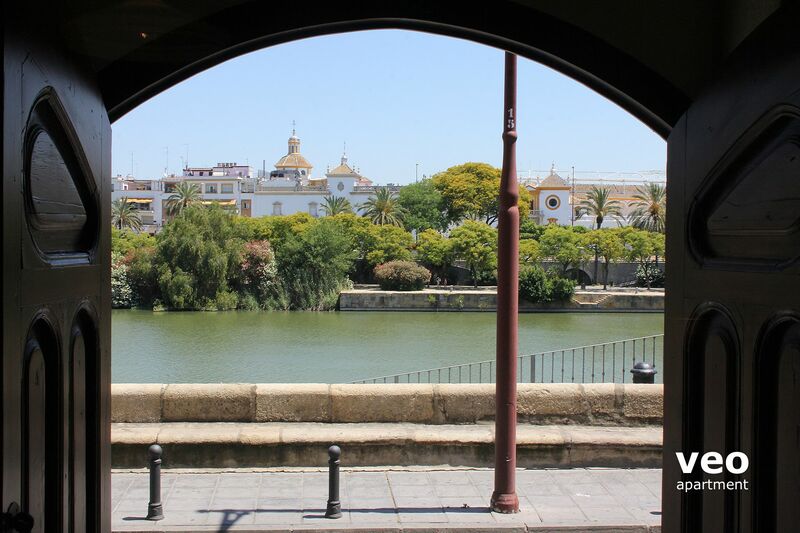 The lower terrace has garden furniture with seating and a canopy - perfect for enjoying an unrivalled view of the Guadalquivir River. On the upper terrace there is a traditional table football game and 4 deck chairs - making it an ideal spot for sunbathing. The house also has wi-fi internet access, air-conditioning and 2 fireplaces. There is a TV on bedrooms 1 and 3 (though not in the living area on the ground floor). Parking available upon request (read conditions). Daily rate: EUR 15. Reduced price at car park "Mercado de Triana". Located at 200 m from the apartment. Reservation by email required. Baby cot: 25 EUR (1-7 nights). Please request on your booking form. "Beautiful house, great views, perfect location"
we loved everything about the town house. The house had everything we needed - comfortable beds, great bathrooms, great view. 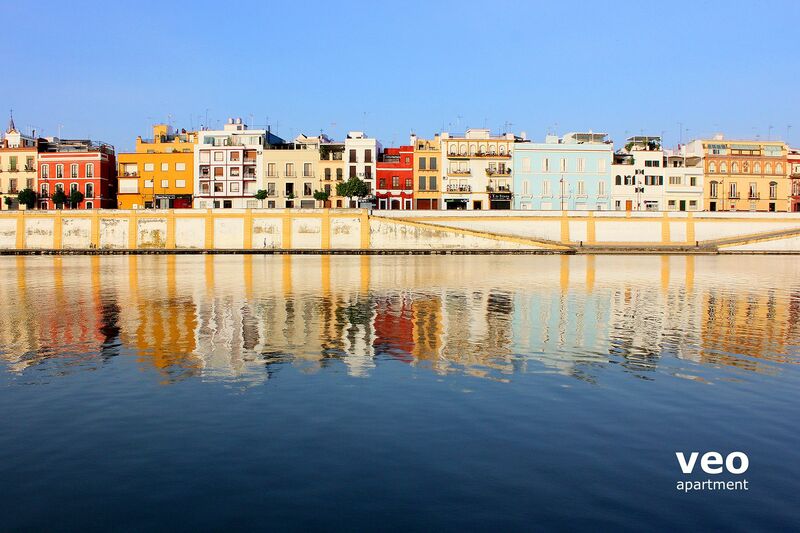 We loved being in Triana and exploring the area. "Schönes traditionelles Einfamilienhaus in perfekter Lage"
Abweichend von den Bildern wurde auf der Terrasse eine Überdachung gebaut, die so groß ist, dass sie fast alles überschattet. Im Sommer sehr sinnvoll. Wir wollten dort allerdings im November Sonnenbaden um dem schlechten Wetter in Deutschland zu entkommen. Daher im Winter nicht empfehlenswert. Ansonsten ein sehr schönes Haus, sehr traditionell mit wunderbaren Türen und verziertem Glas. 2 Holz-Feuerstätten sorgen für gemütliche Wärme und Veo hat es sogar geschafft, dass noch Holz geliefert wurde bevor wir eintrafen. Alle Klimaanlagen wurden auf Heizen gestellt und funktionierten. Dear Hans-Jürgen. Thank you very much for your feedback. We installed the pergola recently to make the terrace more comfortable. 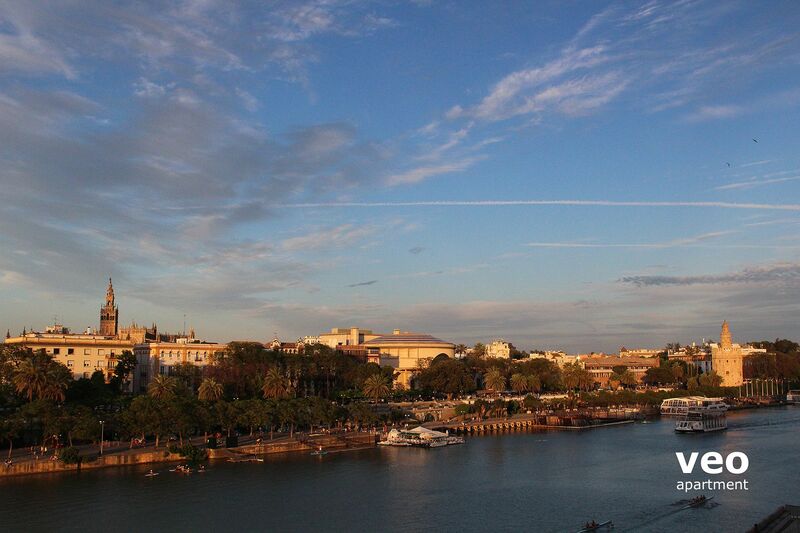 Seville is sunny and hot most part of the year and there is a second terrace on the roof where you can sunbath. We are glad to hear that you find the other parts of the house comfortable and warm for the winter. 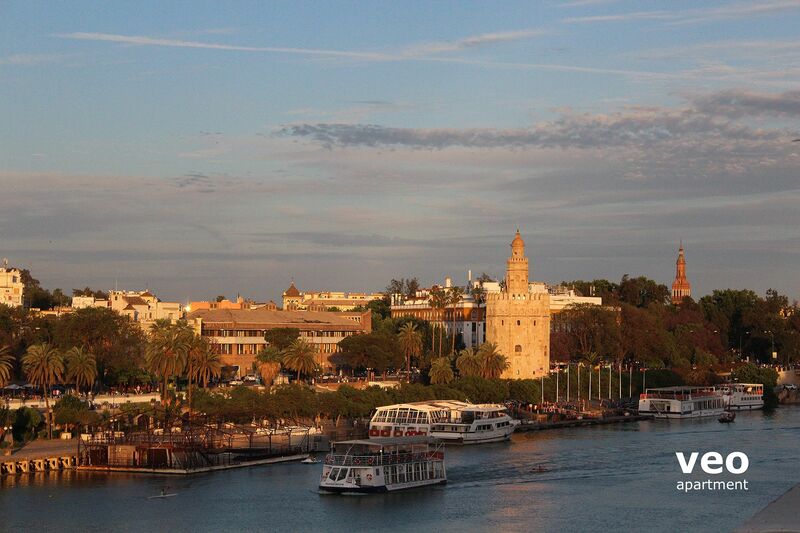 Thank you very much for choosing "Betis Terrace" for your stay in Seville. "Great location - lovely place"
The flat was very comfortable with most facilities available. There were three maintenance issues only: (a) bottom floor sink had no plug (b) door handle on bottom toilet was broken and (c) slight smell of drains in the top floor flat. Other than that, the facilities provided were excellent. The location was excellent, with most things within walking distance and plenty of bars and restaurants close by. The river ran by just in front which gave the place a very open appeal. Loved the upstairs landing for relaxing in the evening. 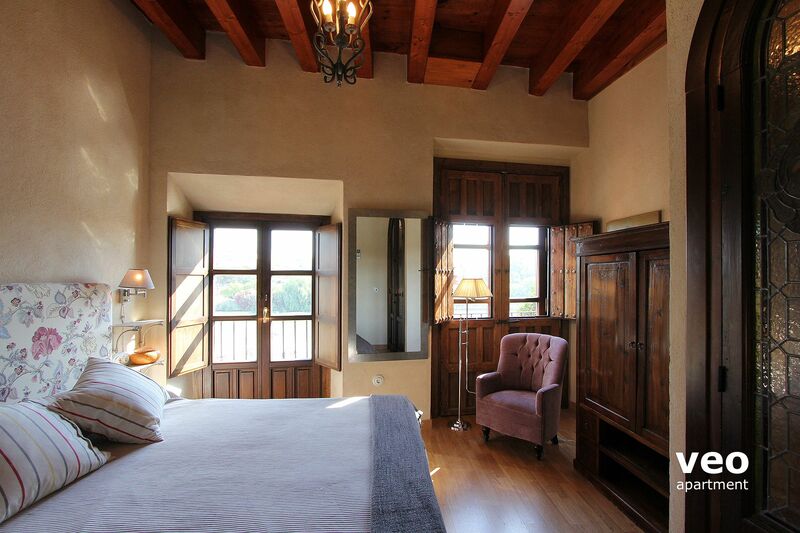 "Beautiful Townhouse full of Spanish Tradition "
We loved this townhouse, full of all the old world Spanish decor, handhewn beams, tile, wooden shutters and all the modern conveniences, washer, dryer, beautiful remideled bathrooms, delightful rooftop terrace overlooking the river! 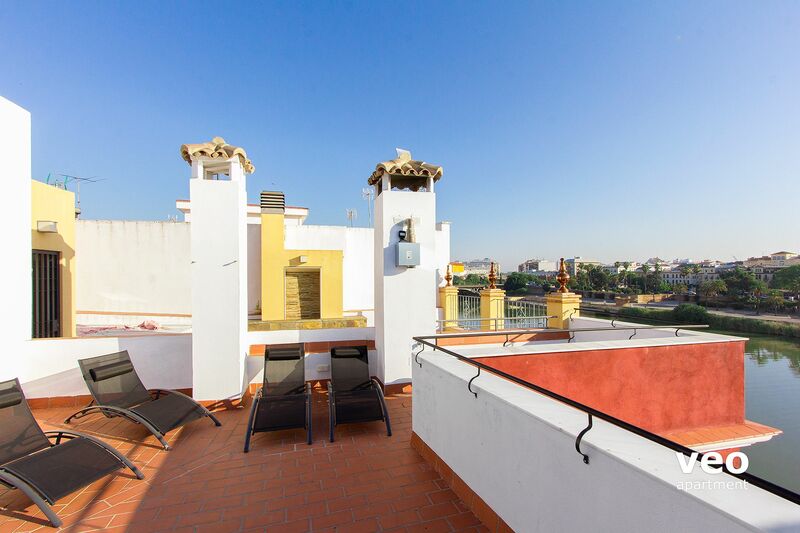 Located in the Triana district steps from a fabulous open air fresh market, easy to get to the sights! "Lovely apartment with great a great view"
L'appartement est vraiment au top, surtout la terrasse sur le toit!! It was a very nice appartment on a good place in the town. We enjoy ............ Next time we take the same. Awesome place. Better than pictures posted! 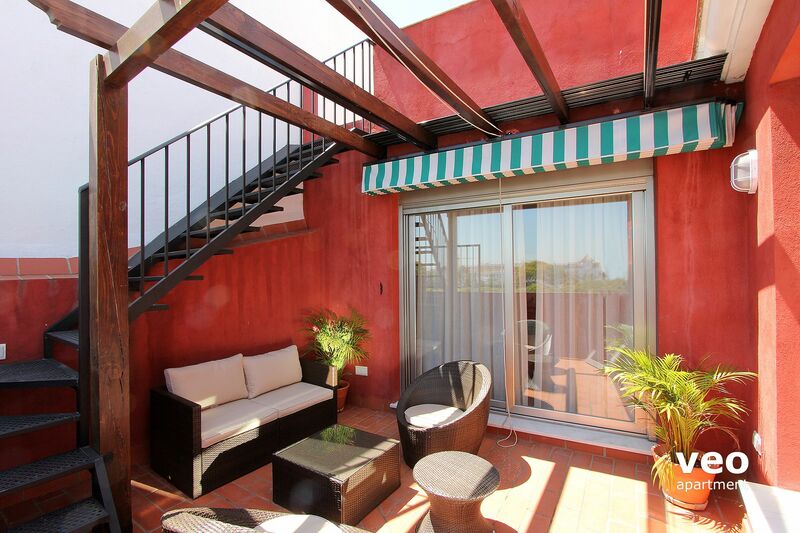 Veoapartment's reply: Dear Sara, it is a pleasure for us that you enjoyed your time in Betis Terrace. We work looking for excellence in our offer. We hope to see you soon again! Nous avons profité a fond du dernier étage et de la terrasse. La proximité du marché couvert de Triana pour acheter les produits frais est génial! 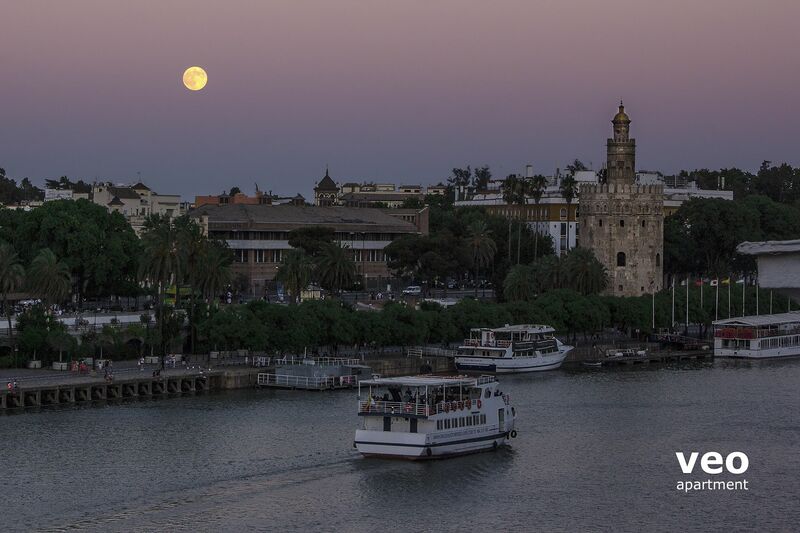 L'apéro sur le muret de la terrasse avec le soleil couchant sur la Tore del Oro, la Giralda et les Arènes de la Real Maestranza juste de l'autre coté du Guadalquivir. c'etait top! "Very nice house in a central location"
We liked the house overall it was well furnished and decorated but would not recommend it for more than 5 people. The double bed in the loft would not be viable if you have mobility issues or small children. Daba la sensación de estar en una casa rústica en plena ciudad. "A great house, comfortable and enjoyable, well-equipped." Everything was straightforward, the house was great, any issues we had were promptly resolved by the property managers. We had a wonderful stay and the view on the river was beautiful. The only drawback was the amount of noise from the street during the night (mostly all night, to 5:00 or 6:00 am, particularly Thursdays to Sundays). There was no loud thumping music. Only happy laughter and even flamenco music and clapping every now and then. That said, we had ear plugs and that helped. We appreciate it is a city and some noise is to be expected. Veoapartment's reply: Thank you for your comments and also for staying in Betis Terrace. 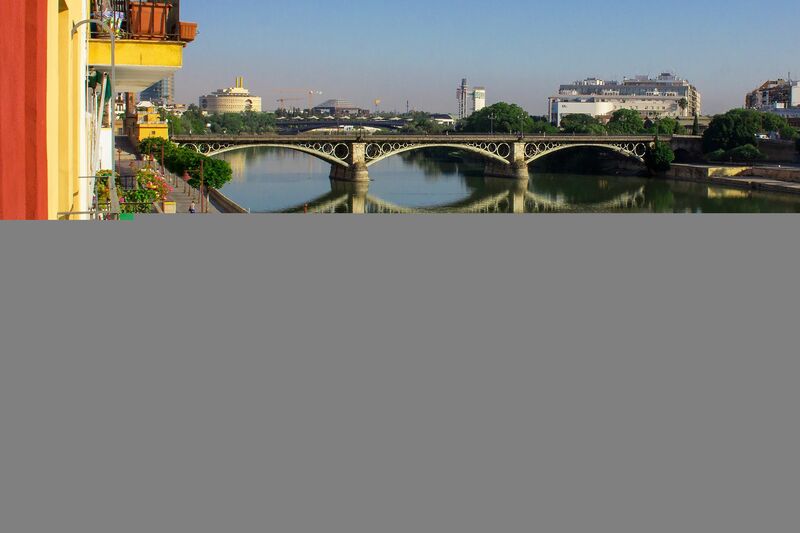 Undoubtedly Betis street is a busy street, which is also part of its charm! We have equipped all windows with a double-glass and rubber the frames, reducing substantially the level of occasional noise. "Luxurious apt. 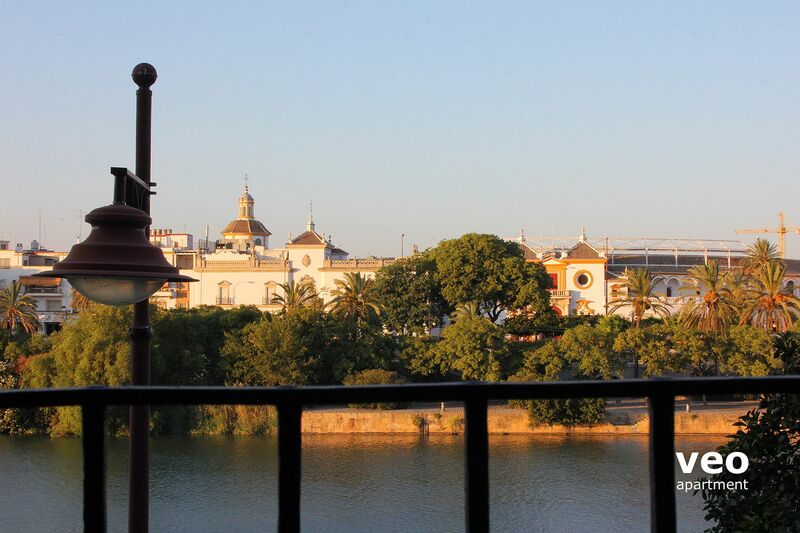 in Seville, wonderful terrace and views of Seville"
Veoapartment was very helpful and courteous. Responded quickly to emails, and guided us through the leasing process. They met us at the apt. on the appointed time. The apt. is indeed very stylish and comfortable, and the owners have put a lot of money and effort into it. It's "old world" meets modern style and comfort. The place has been renovated completely with comfortable furniture, well stocked kitchen and modern bathrooms. 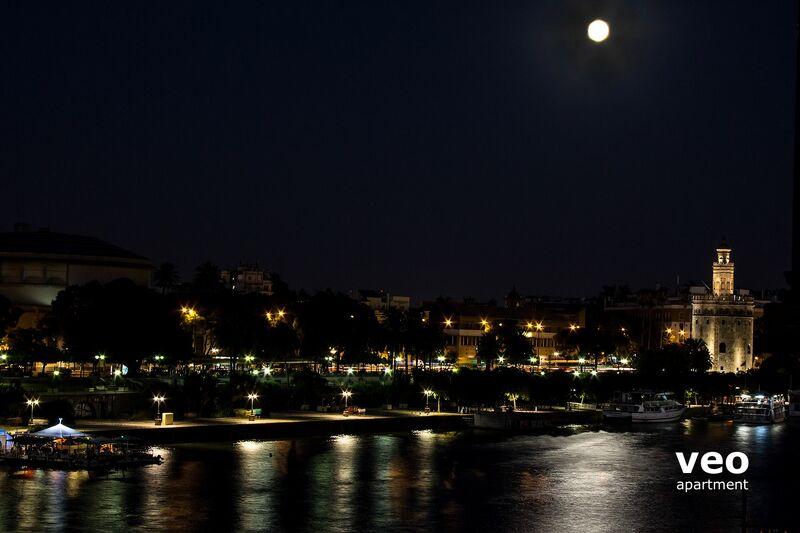 The location is perfect if you don't mind walking a little, across the river from all major attractions with amazing views at night. It was simply the best apt we have rented in Europe. Three things worth mentioning but don't retract from the positive opinion we had: 1) there was a funky smell in the kitchen on the top floor one of the nights we were there, even though we did not use the kitchen. We kept the windows open and the door closed, so it did not bother us greatly. 2) the third bedroom has two twin beds, one a bunk bed you have to climb up to. This is worth considering if you are an adult and esp. if you are a couple. It would be fun for a child, but sleeping in a bunk bed is not fun if you are a middle aged man. It would be perfect for a family with kids. 3) the internet signal is spotty. There were some mysterious blind spots, sometimes just feet from a strong signal. For example, you can't get a signal if laying on the bed on the third floor but if you move to the couch ten feet away, you are ok. Overall, I would highly recommend this apt and the services of Veoapartment. Veoapartment's reply: Dear Osmany, Thank you for choosing Betis Terrace and also for your kind comments on its style and comfort. Let me address some or the other comments and also the measurements taken to improve Betis Terrace based on them. 1) In the upper kitchen there was indeed a poor isolation of the dishwasher discharge pipe, possible cause of the smell. This has been corrected through proper isolation. 2) I agree that the bunk bed (which is extremely comfortable once you get there!) is more suited for kids or young people. Nevertheless, Betis Terrace offers two double and three single beds in addition to the more exotic bunk bed. 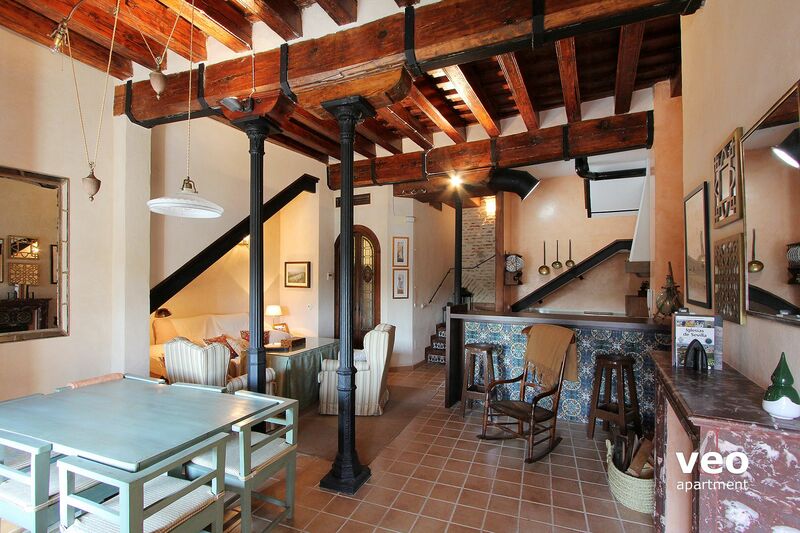 3) Betis Terrace is a XVII and XVII century building that has thick stone & brick-built walls and ceilings. WIFI waves occasionally get some difficulties to get through them since some of them are over two feet wide! We are setting WIFI signal repeaters to overcome these, intrinsic to the building, difficulties. "Vus splendide sur Séville, confortable, et très bien situé"
Les plus: Maison très stylée, décorée avec gout. Très bien située. Confortable. Les moins: quelques odeurs d'égout parfois, surement dues à la proximité du Guadalquivir.